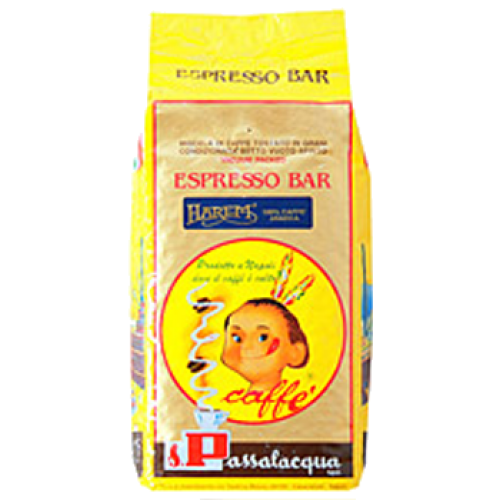 Passalacqua Harem 100% Arabica coffee beans is one of the finest blends in the world. It consists of 10 different Arabic beans including two of the most rare and most valuable coffee beans ever. This blend is, in fact, the flagship of Passalacqua's range and is dedicated to connoisseurs. Harem is the result of a blend of 10 different beans of finest coffee from the world's best plantations. Among these are Jamaica Blue Mountain and Puerto Rico San Pedro, which make this product unique in terms of aroma, taste and value. Jamaica Blue Mountain is the most prestigious coffee on the international market, a coffee that tastes like honey with elements of vanilla and dried fruit, unmatched for the tastes completeness. Puerto Rico San Pedro is born in the mountains in central Cordillera, Puerto Rico, over 1000 meters above sea level, and thanks to it it expresses a fruity aroma and taste, as well as nice notes of dark chocolate and hazelnut making it unique. Thanks to the well-balanced mix of carefully selected and exclusive origins, Harem is a blend that can give the palate an intense enjoyment and a sense of well-being. This is a naturally sweet coffee, even without sugar, which is really worth tasting at home or at work to fully understand the delicacy that embraces the palate.